Its innovative technology and ease of use have won the Chevrolet MyLink connected radio many fans since it was introduced in Europe in summer 2012. This autumn, Chevrolet is launching two new versions of the system, with enhanced capabilities and even greater appeal to consumers. "Our Chevrolet MyLink technology enables drivers to stay connected while on the move. Compared to many other systems in the market, it does so in a way that is intuitive and easy to use, while keeping drivers' eyes on the road and hands on the wheel," said Dr. Thomas Sedran, President and Managing Director, Chevrolet Europe. "Our expanded offer of connected radios works seamlessly with our customers' smart phones and is tailored to meet their specific needs," Sedran added. Chevrolet MyLink technology has a lot to offer to the modern connected consumer, be it drivers who want to mirror the functions of their smartphone in the car or tech aficionados who wish to customise their individual ride experience. Built around a 7 or 8-inch high-resolution full-colour touch screen, Chevrolet's MyLink radios allow users to access their choice of media, including specialist apps, from their portable device. This includes phone books, personal playlists, photo galleries, and other stored data. Mass storage devices, including MP3 players, iPod, iPad can be connected through USB, Bluetooth or aux-in jacks. The entry-level version of Chevrolet's MyLink system is currently available on select trims of the Chevrolet Aveo and Trax. It has a 7-inch high-resolution full-colour touch screen and can store the pairing information of up to five smartphones at one time. At the Frankfurt Motor Show, Chevrolet will be showcasing a new MyLink radio that further evolves these capabilities. It features an improved icon-based menu on its 7-inch touch screen. In addition to pass-through and embedded voice recognition, this system will offer text-to-speech, which allows users to listen to text messages from their smartphone**. A rearview camera provides improved vision during parking manoeuvres. This new radio will be offered to buyers of the latest models of the Chevrolet Cruze, the Orlando and the new Camaro. Depending on the model, trim level and market, it may incorporate an integrated navigation system with coverage of all of Europe (map stored on SD card). Chevrolet MyLink technology enables users to access dedicated smartphone apps, such as a navigation app called BringGo which has been available to buyers of the entry-level MyLink radio. BringGo can be purchased through iTunes and Google Play app stores for a starting price of just £39.99. Routes are displayed on 3D maps and projected onto the MyLink radio touch-screen. Thanks to BringGo’s ability to store maps on the smartphone, users have access to locations and turn-by-turn directions even when the phone signal is poor (no data streaming/roaming charges). Available 'live traffic' provides real-time information, such as incident reports and the ability to reroute to avoid traffic jams. The traffic service requires an active network connection through the smartphone. Owners of a compatible iPhone running iOS 6 can direct Siri, an intelligent assistant, to perform a number of tasks while they safely keep their eyes on the road and their hands on the wheel. This includes making voice-activated, hands-free calls to contacts on the iPhone, play songs from the iTunes library or access calendars. To further minimise distraction, Siri takes hands-free functionality even further with an Eyes Free mode. This allows drivers to interact with their iPhones using nothing more than their voice while keeping the device's screen from lighting up. Meanwhile, two free mobile apps, TuneIn and Stitcher, enable users to listen live local, international and internet radio or stream their favourite podcasts right to their Chevrolet vehicle. TuneIn links listeners to a network of 70,000 radio stations from around the world, whereas Stitcher allows users to create their own personalised, on-demand stations or will help them discover new shows based on their listening preferences. As is the case for all Chevrolet MyLink connected radios, owners of the new systems will be able to upgrade their device with specialised apps once they become available. Stitcher will be featured as an embedded app in the latest models of the Cruze and Orlando with MyLink technology, and the new Camaro. 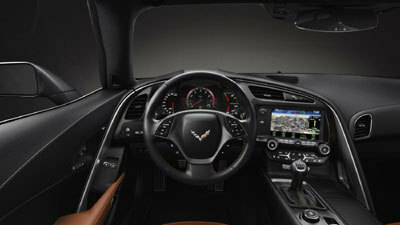 The new Corvette Stingray boasts a host of advanced technologies and options to customise the ride experience. It comes with a tablet-inspired state-of-the-art device MyLink connected radio. The system consists of two 8-inch liquid crystal (LCD) display screens with a screen personalisation option, USB port, SD card as well as a center screen that lowers for hidden device storage. The touring theme places more emphasis on multimedia and connectivity; the sport theme emphasises performance features with a prominent shift indicator and a large radial tachometer; the track theme offers a race-inspired layout containing a sweeping tachometer, Corvette racing inspired shift lights and permanent lap-time displays. In total, the advanced cluster display in the new Corvette Stingray can provide up to 69 unique sources of information, ranging from an interactive performance timer to a tyre tread temperature display. The Corvette Stingray's MyLink connected radio, too, enables voice recognition and text-to-speech**. Up to 10 Bluetooth-enabled devices can be paired and several of them connected at one time; connectivity is also possible through USB and aux-in jacks. A rearview camera is standard, customers can opt for an integrated navigation system. Visitors to the Chevrolet stand in Hall 9 will have the opportunity to test all three radios in different vehicles on the stand. During the press days (10 and 11 September 2013), moreover, representatives from the BringGo, Stitcher and TuneIn brands will be available on site to explain the functionality and wide range of benefits these apps offer to drivers.